I came back from the plot this evening and they have had my Kent Blue peas. And beheaded lots of the flowers – the cerinthe have been hammered. They are funny birds, but right now I wish they would just sod off. So tonight I will be on a potting on rescue mission, and taking the peas to live in the shed for a week to recover as there’s not enough light on the balcony. Apart from that minor hiccup it’s been a good weekend, which will be topped off with a big serving of fabulous PSB tonight for dinner. I love the stuff – or I do until it’s all I’ve been able to pick for weeks on end, when its delights pall somewhat. It does seem to be coming all at once this year. 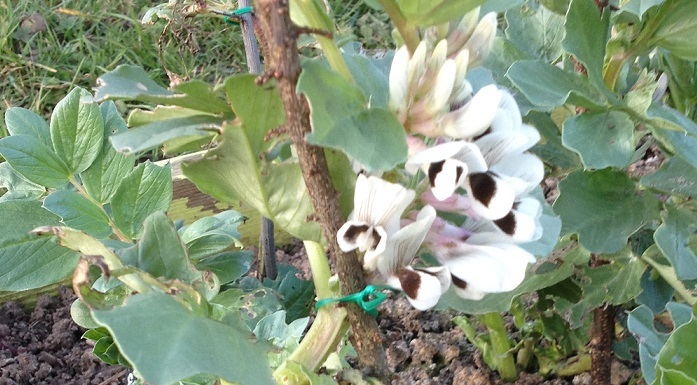 The staked broad beans are covered in flowers already, which bodes well for an early crop if the bees get busy. Plot 92 has had a fair amount of work this weekend. The grass has been cut back and stacked ready for burning (wind was in the wrong direction both days) and I have started cutting and stacking turves where the grass is worst. I’ll cover that with some black plastic and leave it to rot down. 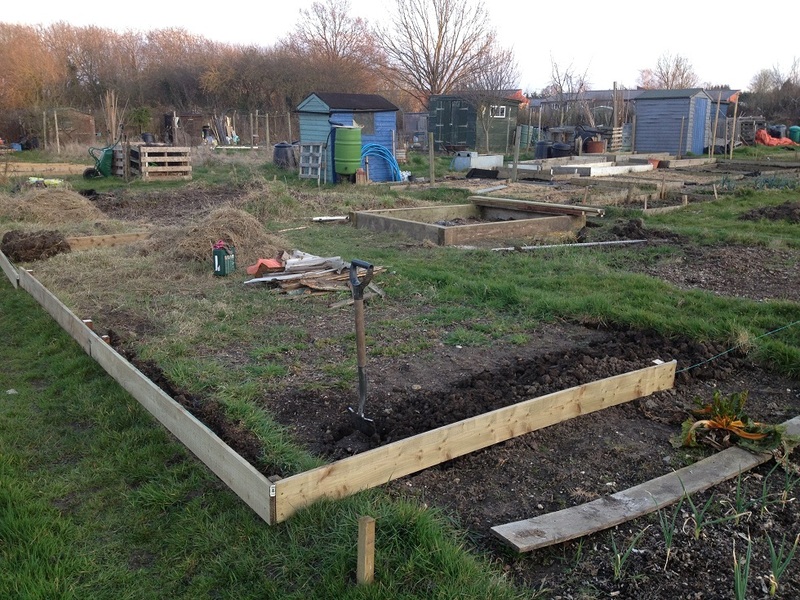 I’ve brought some gravel boards up to edge my half – am still sticking to no raised beds on this patch, other than perhaps for the saffron if I do end up moving it. I’ll paint them at some point, right now I want to get the ground prepped. 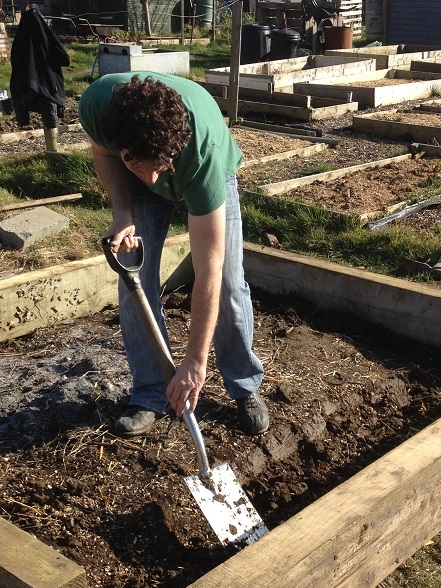 And it is lovely soil so far, nothing like the slog I’ve had on my plot. Piero came down today to help, which is a fairly rare occurrence, but incredibly means that I have a greenhouse base set up! Wheeeeeee! Those sleepers are pine I think – it didn’t take much to saw through them. Not that I did any of that. 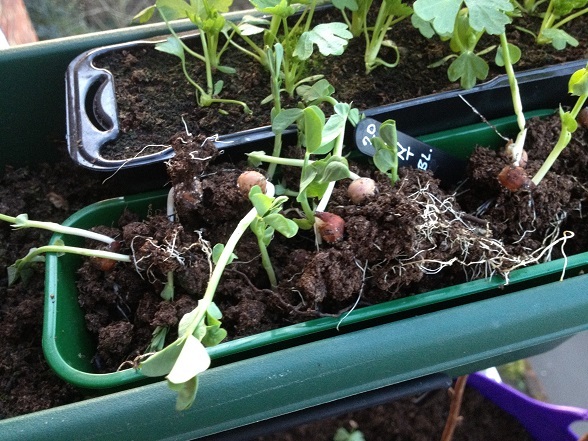 I sat on them to ‘keep them steady’ while Piero put his back into the task… After much research, some manoeuvring and a little bit of shouting, the base is virtually square and has a slight fall to the door end so my water butts will fill up. I’ve put metal plates on the sleepers to try and keep them from moving about while they settle on the soil and will attempt to stick the greenhouse on top of them as soon as I can, (I meaning we) possibly next weekend.